Steel Crest decorative wall vent covers are available in 24 sizes and are made in the USA. These return air grills come in white, black, oil rubbed bronze or silver powder coated finishes and will look great in any home or office. Because the decorative wall vent covers are powder coated instead of painted, they are less likely to chip or scratch. The return air grills are manufactured with 18 gauge steel and are 1/8" thick. 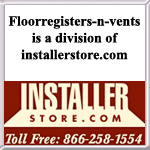 Our decorative wall vent covers are, for the most part, made to order and are not generally stocked items. There are three different decorative designs to choose from Tuscan, Slotted and Square. These Steel Crest Basic Series return air grills can be made in any size, just call for details. To install the decorative wall vent covers, simply screw mount them into your wall. Each order comes with screws and feature a counter-sunk design to help keep the screws flush with your wall. The return air grills have a frame that is 3/4" deep that goes into the wall opening. Tip: When ordering your return air grills, be sure to measure the existing hole opening in the wall. The 10 x 10 decorative wall vent covers will fit into a hole that measures 10 x 10. The outer border is additional 2" all the way around. Important: The Basic Series return air grills are considered a special order, non returnable item and cannot be canceled once payment is received. These decorative wall vent covers will ship out 2 to 4 weeks after an order has been placed. 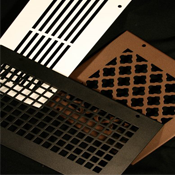 Find these return air grills in the same style as a wall register as well as a filter grille. Looking for other decorative wall vent covers? Take a look at the other Steel Crest design options! Our Tuscan return air grilles will look amazing in any home. Order today by calling us at 866-258-1554 Monday through Friday from 8am to 5pm CST.